Compared to binary switching functions, the multiple-valued functions (MV) offer more compact representations of the information content of signals modeled by logic functions and, therefore, their use fits very well in the general settings of data compression attempts and approaches. The first task in dealing with such signals is to provide mathematical methods for their representation in a way that will make their application in practice feasible. 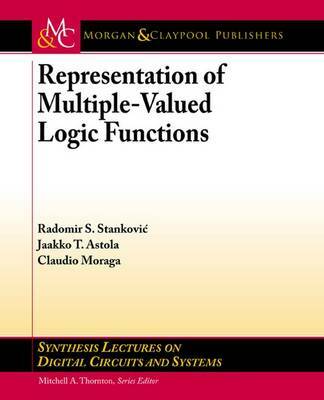 Representation of Multiple-Valued Logic Functions is aimed at providing an accessible introduction to these mathematical techniques that are necessary for application of related implementation methods and tools. This book presents in a uniform way different representations of multiple-valued logic functions, including functional expressions, spectral representations on finite Abelian groups, and their graphical counterparts (various related decision diagrams). Three-valued, or ternary functions, are traditionally used as the first extension from the binary case. They have a good feature that the ratio between the number of bits and the number of different values that can be encoded with the specified number of bits is favourable for ternary functions. Four-valued functions, also called quaternary functions, are particularly attractive, since in practical realization within today prevalent binary circuits environment, they may be easy coded by binary values and realized with two-stable state circuits. At the same time, there is much more considerable advent in design of four-valued logic circuits than for other $p$-valued functions. Therefore, this book is written using a hands-on approach such that after introducing the general and necessarily abstract background theory, the presentation is based on a large number of examples for ternary and quaternary functions that should provide an intuitive understanding of various representation methods and the interconnections among them.